In 1978 Mexican agronomists crossed two varieties of yellow bean in an effort to improve crop characteristics and yields. They named the new variety mayocoba after a village in Sinaloa state. The experimental bean was very successful and thousands of tons of these beans are grown each year for consumption and export. Peruvian beans cannot be exported to the U.S. since an American filed a patent on a bean called Enola which he claims was used to cultivate the mayocoba in Mexico. Although the American grown beans are labeled Enola, some retailers relabel them mayocoba so their hispanic consumers will know what they are buying. Long a dietary staple of the natives of Peru and other South American countries, the Peruvian bean is high in fiber and carbohydrates and low in sodium. It is also a good source of iron containing about 15% of the RDA in a single 35g serving. They are relatively low in calories at 100 calories per serving and contain only about 1g of sugar. 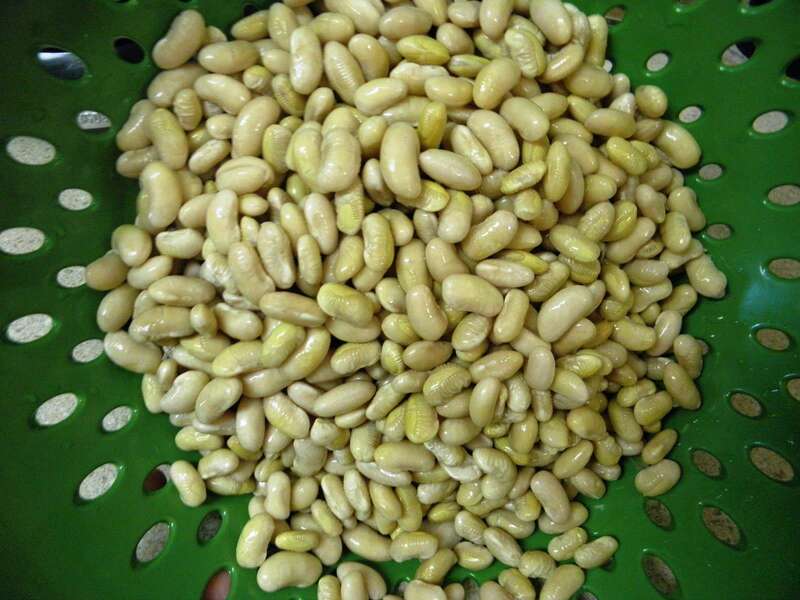 As with other beans, their protein profile is incomplete and they need to be eaten with rice or corn in order to add amino acids to complete the protein. While almost identical to pinto beans in nutritional values and flavor, Peruvian beans have a creamier texture and disintegrate less when cooked. This had made them a popular substitute for pinto beans in traditional Central and South American dishes. In Spanish, Peruvian beans are called frijoles peruano and they are often substituted for other white beans and pinto beans. They may be used in soups, stews, salads and to make refried beans for burritos and tacos. Served with rice or corn they make a high protein vegetarian meal. The beans should be rinsed and soaked for two to six hours before cooking. The beans may be boiled in chicken broth with garden vegetables to make a nice soup or they may be sauteed in olive oil with finely minced celery, carrot and onion for either an entree or side dish. Salt, sugar, and acidic ingredients like tomato, lime and vinegar can cause the beans to break down and should be added as late as possible in the cooking process. The Peruvian bean, in one form or another, has been a staple of the South American diet since the time of cave dwellers. Archeologists have found yellow beans in caves which were inhabited thousands of years before the Inca tribe dominated Peru and the Andes region. No genetic engineering has ever been used to modify the mayocoba bean and it is a wholesome, healthy addition to any diet.